Skylanders Cloud Patrol is set in a new region of Skylands that has been overrun by the evil minions of Portal Master, Kaos. 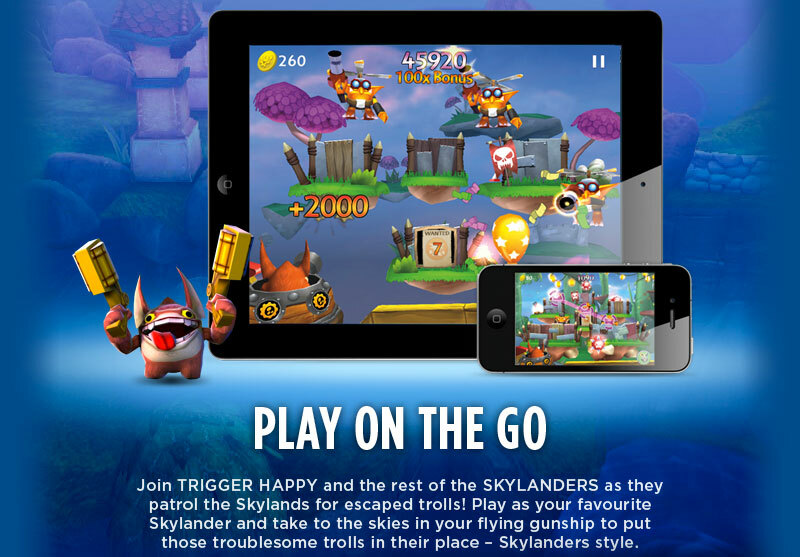 With all 30-plus skylanders available to unlock, the game lets players take command of a magnificent sky-ship and use their favourite skylander to dispatch the baddies using touch gestures to tap-and-shoot or swipe the screen to create amazing combos. 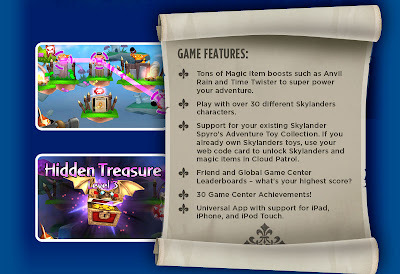 Skylanders Cloud Patrol lets fans unlock skylanders and Magic Items and bring them to life in Cloud Patrol using the code bundled with each Skylanders action figure. Additionally, new Portal Masters may earn or purchase in-game currency to build their virtual mobile skylanders collection, Magic Items, and more.Cloud Patrol also features Game Center leaderboards and achievements and a 3D character viewer that allows players to browse their entire in-game collection. 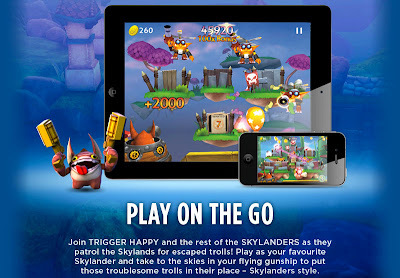 Players assume the role of a Skylander (the game comes with Trigger Happy, but you can unlock others with the Web Codes that are included with the figures) who mans a turret, taking out escaped Trolls. The more Trolls you hit at once, the larger your combo. If you hit a bomb, though (like in Fruit Ninja), the game is over. 99 cent is totally fair for this game. I think the really clever part is they added the 3DS' "Element of the Day", which allows players using the chosen element for the day to score more coins than usual. This means anyone who just plays Skylanders on their iDevices will ultimately end up having to spend some cash on figures like the rest.